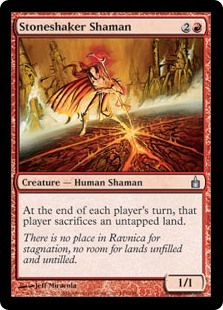 This installment of Dig Through Time digs all the way back to 2006 and one of my favorite blocks of all time: Ravnica! As you may know, Ravnica is the block that introduced us to guilds, and the guild names that we all still use today. The block includes Ravnica: City of Guilds, Dissension, and Guildpact. Although it’s not the first multicolored block, it did help iron out each two-colored pair’s overlapping identity and pave the way for more frequent enemy-pair cards in modern day sets. 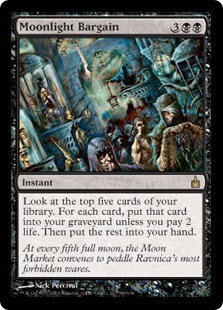 Ravnica is famous for its cycles of guildmages, signets, bounce lands, and, of course, the shock lands; however, there are tons of other juicy tidbits hiding in this block. Before I get to that, I want to correct an error I made last time. 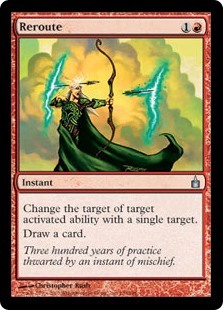 In my Mercadian Masques article I said that you could cast Reverent Mantra naming red and then cast Blasphemous Act or another damage-based wrath to make a one-sided board wipe. It was pointed out to me that Reverent Mantra gives the protection to all creatures, not just your own. Mantra is still a good card, but that particular interaction won’t do anything for you. The more you know! Moving on, let’s talk about Ravnica! Since multicolor is the meat of the block, this article starts off with multicolored cards instead of putting them near the end, because there are some very spicy multicolored cards that almost no one is playing. Let’s jump right in! Split cards like Order // Chaos were introduced in Invasion block as two different mono-colored cards on each half of a card. They were brought back in Dissension, but, instead of mono-colored cards, these split cards feature two multi-colored cards on each half. 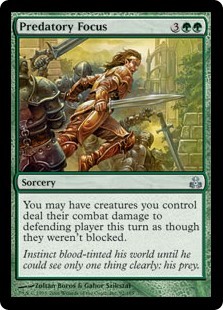 Since I love modal effects, I find it helpful to think of split cards as modal cards with alternate casting costs. Our first five cards belong to this cycle, and have recently become even more playable than they previously were, due to the release of four-color and partner commanders. Hit // Run is played in 77 decks, and is a potential game ender. Hit is a nice edict effect that can slow down voltron decks especially, and decks that rely on mana rocks to accelerate their game. It gives us the added bonuses of being instant speed and dealing damage on top of the edict. 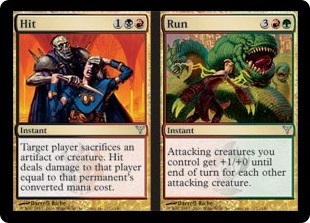 Run is an instant speed Shared Animosity for each attacking creature you control, with no tribal restriction. While Hit is very good, Run can win the game out of nowhere. The fact that you get both options makes this card a worthwhile inclusion. Of the 77 decks that run this card, 42 are Prossh, Skyraider of Kher, which makes sense, since Prossh poops out Kobold tokens for Run. Try this with Tana, the Bloodsower and a partner with black, or even in Saskia, the Unyielding herself. Pure // Simple is an elegant removal spell that gets played in 42 decks. Pure is fantastic in the current meta, with four-color commanders running around, and gets bonus points for hitting any permanent so long as it’s multi-colored. Simple is a little more hit-or-miss. It’s a wrath for auras and equipment, so any sort of voltron commander, like maybe Sram, Senior Edificer or Uril, the Miststalker, can get shut down hard by this three mana spell. The commander that makes the most use of this card is Mayael the Anima, at 9 decks. Try this in Rith, the Awakener or Kynaios and Tiro of Meletis for some flexibility in your suite of answers. Hide // Seek sees play in 166 decks, and is a personal favorite. Hide handily removes those pesky, indestructible gods, as well as any other problem artifacts or enchantments for just two mana. Seek, which requires a little familiarity with your opponent’s decks, or at least with the kinds of threats you might expect to face in EDH, is preemptive combo disruption that gains you life as a side bonus. 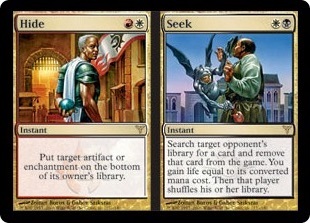 While Hide // Seek is really solid on its own, the card shines when you combine it with Sunforger and Mistveil Plains or Isochron Scepter for repeated use. Interestingly, Kaalia of the Vast runs Hide // Seek the most at 39 decks, but I think there’s some potential for a spell-slinging deck, maybe helmed by Ishai, Ojutai Dragonspeaker + Vial Smasher the Fierce alongside cards like Mirari, Melek, Izzet Paragon, Echo Mage, and Pyromancer’s Goggles. Seeing play in 51 decks, Rise // Fall is criminally underplayed. Rise is a miniature Soulquake that lets you recur value, while setting an opponent back a creature. 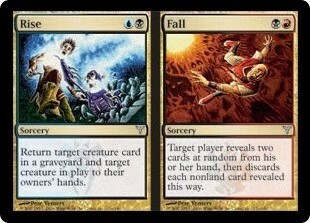 Fall lets you force an opponent to discard up to two cards. The latter is a little dicey, because you could hit lands, which wouldn’t do much, but if you know they’ve played out their lands, or have a grip full of threats, you can feel pretty good about playing Fall. Again, having the option of doing either is what makes this card awesome. The top two decks running Rise // Fall are Nicol Bolas and Thraximundar at 7 decks each. This card would be great in Sedris, the Traitor King or maybe Vial Smasher the Fierce +Kraum, Ludevic’s Opus. Both halves of Crime // Punishment are too good for it to see play in only 120 decks. Crime is similar to Obzedat’s Aid, though it’s limited to your opponent’s graveyards. Reanimating a creature for five mana is a pretty standard price, but having the option of reanimating an enchantment is unique, and potentially quite powerful if cards like Grave Betrayal, Painful Quandary, or True Conviction see any play in your meta. 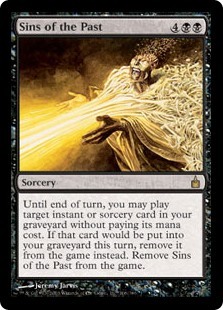 Punishment is like a Ratchet Bomb, allowing you a pinpoint board wipe for the most troublesome converted mana cost permanents on the battlefield. Crime // Punishment sees the most play in Karador, Ghost Chieftain at 23 decks. I think it has real potential in Atraxa, Praetors’ Voice, Saskia, the Unyielding, or any of the other four color commander combinations that are in Abzan colors. It’s currently in my paper version of Tymna, the Weaver + Sidar Kondo of Jamuura. I’m honestly surprised that this card doesn’t see wider play as it is. Anthem of Rakdos sees play in 204 decks. It’s a bit of a tricky card to run, but has a worthwhile payoff. I run a copy in my own papered-out Saskia, the Unyielding deck. The plan is to play out my hand, but keep my opponent’s hands small as well, with cards like Rix-Maadi, Dungeon Palace, Stronghold Rats, and Sire of Insanity. Each turn I plan to draw two to three extra cards with stuff like Phyrexian Arena, Asylum Visitor, and Blood Scrivener, drop those cards before my combat phase, and then swing in for absurd amounts of damage. 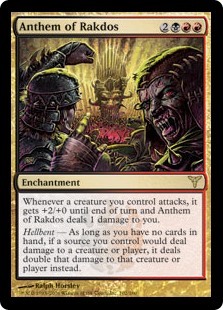 Malfegor makes the most use of this card at 57 decks, but Anthem could be great in Queen Marchesa, with monarch shenanigans allowing you to draw your cards at the end of your turn. Using green’s draw-on-combat-damage-effects, Darigaaz, the Igniter or Kresh, the Bloodbraided could make potent use of this card, as well. Moving in to mono-colored cards, let’s talk about Suppression Field which sees play in 358 decks. I like to think of this card as a Ghostly Prison against combo decks. At 64 decks, this card sees the most play in Grand Arbiter Augustin IV. That makes sense, as it synergizes pretty well with Augustin. Suppression Field is also good in decks that exploit enter the battlefield effects like Roon of the Hidden Realm or Brago, King Eternal, since triggered abilities get around the tax. You could even try building this into a nasty Boros prison deck, since most Boros commanders have attack triggers, and not many of them run activated abilities outside of equipment. I recommend throwing this into any deck with white if you have a lot of combo in your meta, and you aren’t running too many activated abilities yourself. 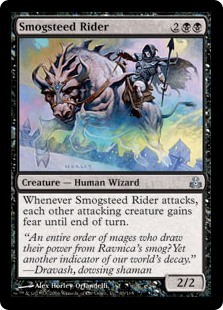 Smogsteed Rider is run in 17 decks and that number seems absurdly low. Fear has been phased out as an evergreen keyword, so let’s get a quick refresher. Fear says “This creature can’t be blocked except by artifact creatures and/or black creatures.” That is really good! It’s not quite as good as Archetype of Imagination, but it also doesn’t cost six mana, and it only has one card type, which makes it slightly harder to remove. This card should be run in black decks running any sort of combat strategy. Of the 17 decks running this card, Alesha, Who Smiles at Death runs it the most with a mere 5 decks. Team-wide evasion is a really strong effect and commanders who trigger on attack or combat damage like King Macar, the Gold-Cursed, Ashling, the Extinguisher, Ink-Eyes, Servant of Oni, and Silas Renn, Seeker Adept should think about putting Rider in. Additionally, it’s obviously good in decks that can go wide with token strategies like Nath of the Gilt-Leaf and Queen Marchesa. Moonlight Bargain is a fantastic double-use card that sees play in a 374 decks. You get to draw and/or mill five cards for five mana, at instant speed. You can choose for your cards with Dredge, Unearth or Flashback; your land/graveyard combos; your reanimation targets; and Anger and friends in the graveyard while drawing gas! Toshiro Umezawa plays Bargain the most at 49 decks, but this card is excellent in Sheoldred, Whispering One, The Gitrog Monster, Sedris, the Traitor King, and Tasigur, the Golden Fang, just to name a few. Moonlight Bargain does so much work in a black deck. The next time you’re building a deck with black in it, save a slot for this card and just see how well it performs for you. Speaking of really powerful black cards that don’t get played very much…Sins of the Past is played in all of 173 decks. Black is traditionally the color of creature reanimation, but it doesn’t generally get extra value out of other kinds of cards in the graveyard, so this card is extremely unique. The only other mono black card that interacts with instants in the graveyard is Toshiro Umezawa. Maybe you’ve just put In Garruk’s Wake, Rise of the Dark Realms, or Decree of Pain into your graveyard with Moonlight Bargain. Not only do you still get to cast it, you get a discount. Or maybe you just want to reuse Moonlight Bargain. Recasting it for one more mana is still a great deal. Jeleva, Nephalia’s Scourge plays this card the most at 79 decks. One commander that surprisingly doesn’t seem to be playing this card at all it Yidris, Maelstrom Wielder. Sins of the Past makes your wheels safer, if you’re running wheels in the deck, and you also get to cascade off of a nice converted mana cost of six no matter what you cast from your graveyard. Reroute is currently run in 114 decks, and seems like a solid 10 on the fun scale. Reroute Royal Assassin’s ability back at itself, send Nihil Spellbomb back in its controller’s face, make Karn Liberated exile himself, or have Strip Mine blow up one of it’s controller’s other lands instead of yours. This card is simple, versatile, and entirely unique. The top Reroute commander is Niv-Mizzet, the Firemind at 9 decks. I think it has some good potential in Aurelia, the Warleader or Grenzo, Dungeon Warden with other unusual control effects like Lapse of Certainty and Imp’s Mischief. The next time you’re looking to catch your opponents completely by surprise with a weird control or chaos deck think about building with Reroute. Stoneshaker Shaman is played in 115 decks and belongs to the Citadel of Pain family of punisher stax cards. I like Shaman better than Citadel, because it slows the control player down a little more efficiently. If they want the option of casting a Counterspell on your turn, they have to leave up three lands, and sacrifice one of them. Zo-Zu the Punisher plays Stoneshaker Shaman the most at 33 decks, but it has a lot of viability in creature-based decks that are tapping out on their turn and have few options against control strategies such as Ruric Thar, the Unbowed, Prossh, Skyraider of Kher, and Shattergang Brothers. If you play against a lot of control, or you just want to watch the world burn, give Stoneshaker Shaman a try. Do you like getting damage in? Are you burning seven mana on Siege Behemoth to get poison through in your Atraxa, Praetors’ Voice infect deck deck, only to waste your turn when your opponents respond to combat with a Swords to Plowshares? May I suggest Predatory Focus, which sees play in just 71 decks, and gives your whole team super trample for only five mana? As an additional upside, it’s not attached to a body, so it dodges creature board wipes. This card is nuts, and it sees almost no play. Run it with Hit // Run, Terraravager, or Thromok the Insatiable and blow past chump blockers. If you’re feeling especially sadistic, pair it up with stuff like Larceny from my last article. Multani, Maro-Sorcerer is the commander that runs this card the most at 8 decks, which should tell you everything you need to know about how well-known the card is. This card would be fantastic in many of the legendary snakes like Sakiko, Mother of Summer, Seshiro the Anointed, or Shisato, Whispering Hunter from Kamigawa block. Give this card a try the next time you build a green deck, it’s not even $0.20. Elemental Resonance sees play in 173 decks, most of which run an aura voltron strategy, such as Uril, the Miststalker and Krond the Dawn-Clad. It’s also good with the Theros gods, since Resonance doesn’t care if the god is an enchantment or a creature, and the gods have indestructible to make them difficult to remove. The deck that runs Resonance the most is Sigarda, Host of Herons at 19 decks. 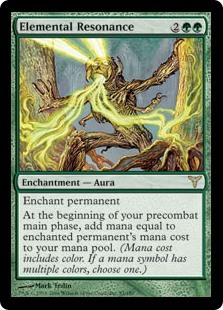 Resonance would also be great in Sapling of Colfenor or Sliver Hivelord deck, since both generate a decent amount of mana and are tricky to get rid of. Apart from commanders, you could slap this on Mockery of Nature, Void Winnower, Akroma’s Memorial, or any of the Bringers from the Bringer Cycle, like Bringer of the Green Dawn, for more big mana. 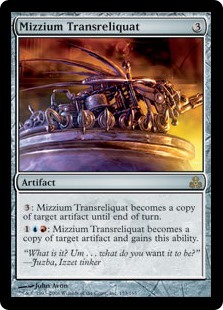 Mizzium Transreliquat is a really unusual card that sees play in 345 decks, and can always be the best artifact on the table. Is your opponent playing Akroma’s Memorial? Now you are, too. Blightsteel Colossus? If you have this out on the battlefield already, you can pay 3 for a hasty copy. Wish you had a copy of that shiny, new Paradox Engine? Now you do. There is an argument to be made that this card is at least as good as Sculpting Steel and Phyrexian Metamorph. At 31 decks, Breya, Etherium Shaper is understandably playing the most copies of this card, but 31 is not a lot. Compare that to Daretti, Scrap Savant, which sees play in 1286 decks out of 1513 total Breya decks. This card is a must in RUx decks that have any sort of artifact synergies. To show off some of these cards I ended up going with Vial Smasher the Fierce + Ishai, Ojutai Dragonspeaker. Unlike past articles, I didn’t put every single card that fit into the deck’s colors, since some of the cards here call for a little bit of a more focused strategy. I also wanted to show off split cards, so I built a deck that could feature them heavily. I hope you like my janky brew. Please tune in two weeks from now for another set review from the pages of Magic history.